Mark Rivera is a local ceramic artist, in Davis, California. “Taking the Scenic Route” was a commissioned piece by the Yackzan Group in 2008. The 1st level is in tribute to the farmers and farming community, reflecting the lines of the fields and crops that inspired him. The 1st level is the ground and earth element, the second level is about the water element – from the salmon that come from the ocean to the freshwater rivers and streams to the irrigation of the land itself. The 3rd level is the air element, inspired by the Great Central Valley. In the center is the sun, and around it is filled with Barn Owls, Stars, Davis crows and the hot air balloons that come across from Napa Valley in the morning to view the area. 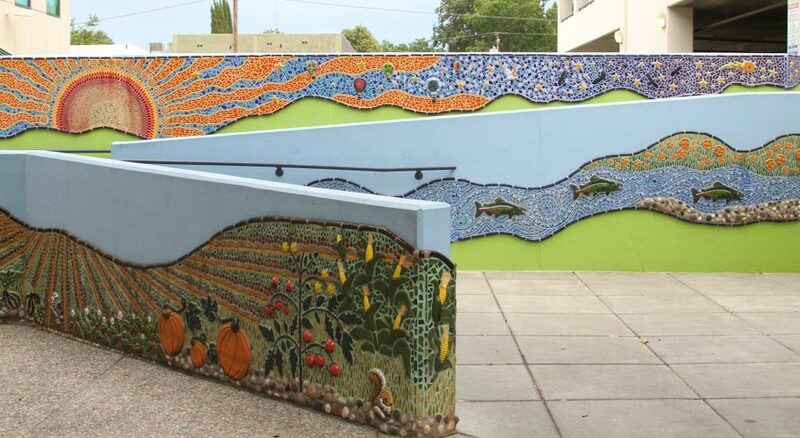 Mr. Rivera has many pieces – both private and public works throughout California.